In its past life the centre was a mill, making beautiful cloth, now it is a hub of activity. Home to many businesses large & small. There are fantastic public transport links & plenty of parking onsite. Our studio is on the 1st floor of building 15. Entrance is via a door under the chimney with Springfield/Gaunts displayed on top. There is also a lift to the left of the entrance door. See below for how to find us, we look forward to seeing you. Please park in the areas shaded in purple. The studio is easily accessible by car either from Farsley or Rodley & is only ½ mile from the Leeds outer ring road A6120. There is plenty of parking on site. Please park in the purple shaded areas as shown on the map at the top of this page. There are regular trains from Leeds, Bradford, Halifax, Hebden, Manchester, York & Blackpool. 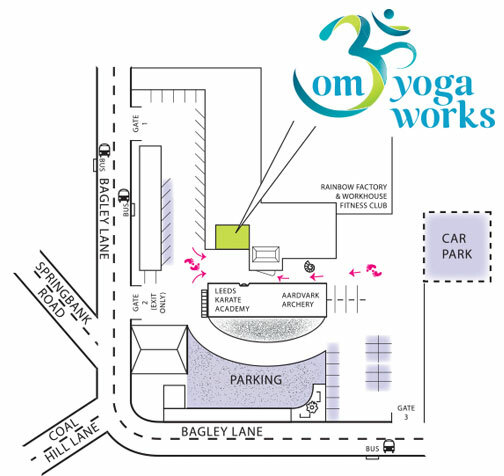 The station is 1.4 miles away from the studio & either a 20-30minute walk or combination of a short walk & bus journey. For walking routes www.walkit.com a handy website that gives routes, times & energy used & saved.